When your child is out in the sunshine, in the UK or abroad, they need to be protected. Follow this advice to keep them safe. 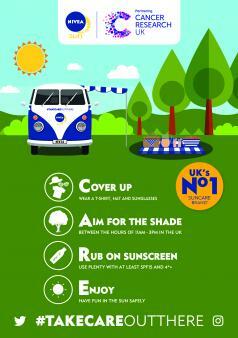 Did you know that overexposure to ultraviolet (UV) radiation causes almost 9 in 10 melanoma skin cancer cases in the UK? Following sun safety advice is essential in the UK as well as when you're on holiday aborad, for yourself as well as your children. Remember you can burn in the UK, even when it's cloudy. UV rays can travel through clouds so watch out – you can still get sunburnt when it’s overcast. Check the Met Office's UV index forecast for information about how strong the sun's rays are where you are. Teach your child the shadow rule. If your shadow is longer than you are, then you are safe from the sun. When your shadow is shorter than you are, the sun can burn you. Keep babies in complete shade – under trees, umbrellas, canopies or indoors. Dress children in cotton clothing that is baggy, close-weave and cool. Oversized T-shirts are good for covering most of their skin. Remember that wet clothing stretches and can lose up to half of its UV protection, so put children in dry clothing after playing in water. Don't put children in vest tops or sundresses if they are spending a lot of time outdoors – shoulders and backs of necks get easily burned. Buy good quality, wraparound sunglasses for your children, as soon as they can wear them. Sunglasses don't have to be expensive brands, but toy sunglasses can do more harm than good. Encourage children to wear hats with brims. The wider the brim, the more skin will be shaded from the sun. Use sunscreen wisely. Apply factor 15+ sunscreen before children go outdoors. Then reapply often to be sure of good coverage. Don't forget their shoulders, nose, ears, cheeks and the tops of their feet. Cancer Research UK and NIVEA SUN have created an acronym, CARE, that gives easy-to-remember advice to help you stay safe in strong sun this summer. Cruise holidays - what do they offer your family?